Another earthshaking find within the evolutionary community only spotlights once again the inherent irrationality of the faltering, fallacious theory. 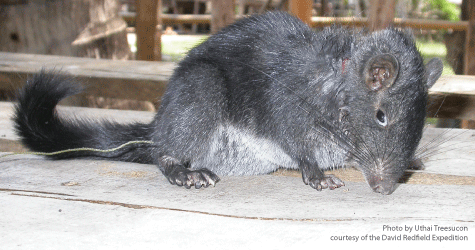 During a Southeast Asian expedition, retired Florida State University science professor, David Redfield, captured the first photos of the Laotian rock rat, once believed to have gone extinct more than 11 million years ago. The fossilized remains, collected previously from sites in Pakistan, India, Thailand, China, and Japan, were thought to verify this last known relative of a long-extinct family of rodents known as Diatomyidae (“Retired Professor Captures...,” 2006). Surprise, surprise—another alleged “ancestor” eliminated from the tattered evolutionary tree. 1. Evolution: All animals we see today are advanced forms of primitive precursors, and descendants of a single ancestor. As more advanced forms have evolved by means of adaptation, natural selection, survival of the fittest, and genetic mutation, the earlier forms were naturally displaced and disappeared. Fossils, millions of years old, represent life forms that were the evolutionary predecessors of present life forms, but which went extinct long ago. 2. Creation: God created a spectrum of animals during the six-day week of Creation. While reproducing only after their own “kind” (an ambiguous Hebrew term that likely parallels the modern taxonomic classification “family”), these animals were created with the genetic potential for producing a variety of other species, giving rise to the diversity of animal life presently on the planet. Along the way, due mostly to environmental factors, many animals have become extinct. However, other species have escaped detection by humans for centuries, only to be rediscovered in some remote area. “Retired Professor Captures a ‘Living Fossil’ on Video” (2006), Research in Review, June 13, [On-line], URL: http://www.rinr.fsu.edu/rockrat/more.html.